There is something so comforting in dumplings. 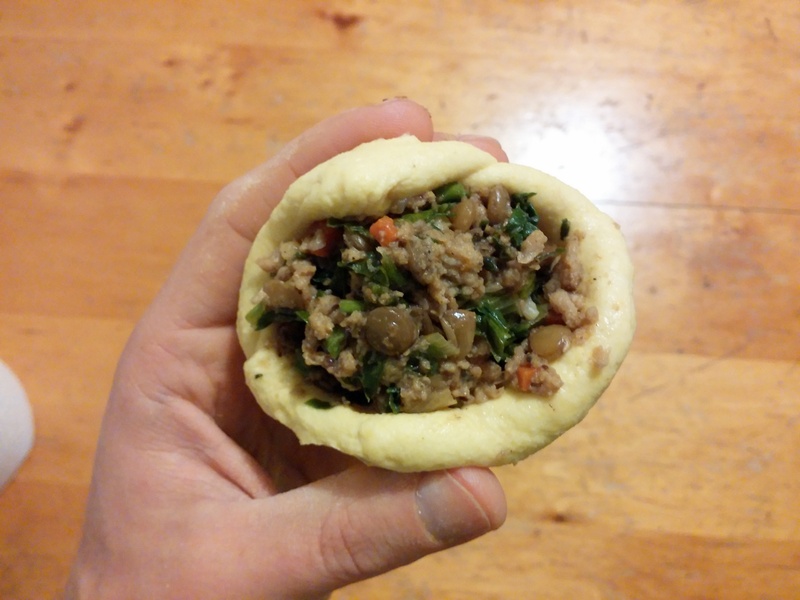 This gentle structure of dough wrapped over a strong flavored filling. It always reminds me of home. Not always my home – but a good dumpling is something that belongs home, something that grandma’s do. Just like that is the Kuba, this Iraqi semolina dumpling filled originally with heavily seasoned meat (here with soy, lentils and mushrooms) was the lunch we had at my grandmother, and later aunt, every Friday noon, just before the Shabat meal, to make sure that afterwards you do to sleep for the entire weekend. These dumplings are not gentle or subtle. Relatively thick dough, strong flavors of cinnamon, cardamon, allspice and celery greens, swim in a sweet-sour tomato sauce with sticky okras. A taste that only the hands of grandma can do. Veganizing this recipe is not an easy thing, mentally, I mean. To change something so profound, a recipe that I wouldn’t dare to change in any other way. 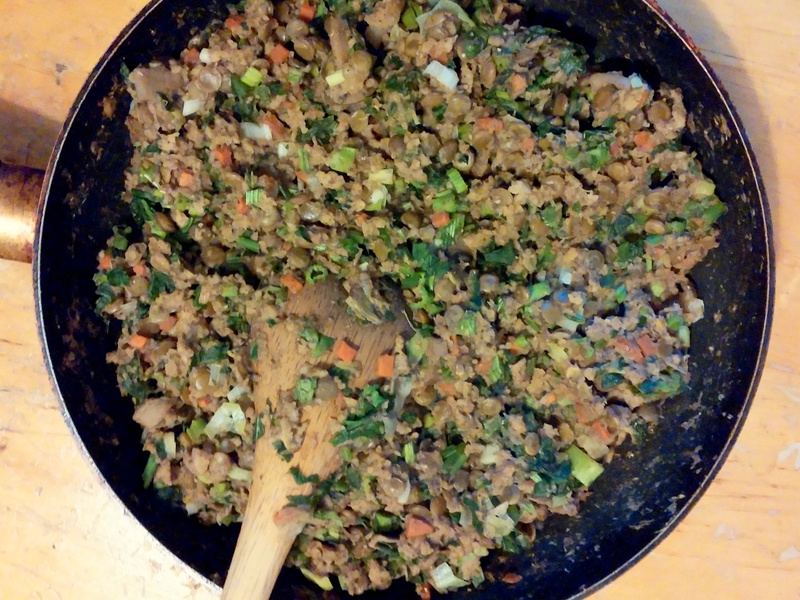 Besides this one very aspect – taking out the meat. 300g mushrooms – portobello are the best, button mushrooms are also ok. Half grated and half diced. Seasoning: salt, pepper, baharat (mixture of cinnamon, cardamon, allspice, cloves and nutmeg). Be generous of the spices. How to make: Easy, saute the onions in some oil, add everything else besides the greens, stir well, season, remove from the flame and add the greens. Let it chill before you go on. For the dough you’ll need 1 kg of fine hard semolina, 300 ml water, salt and a tiny bit of turmeric for the color (and hey, it’s also healthy!). Mix well and kneed a bit, you should have hard, flexible and relatively dry dough. You make circles, in which you create a crater that is then filled with stuffing. Make sure to use wet or oiled hands. 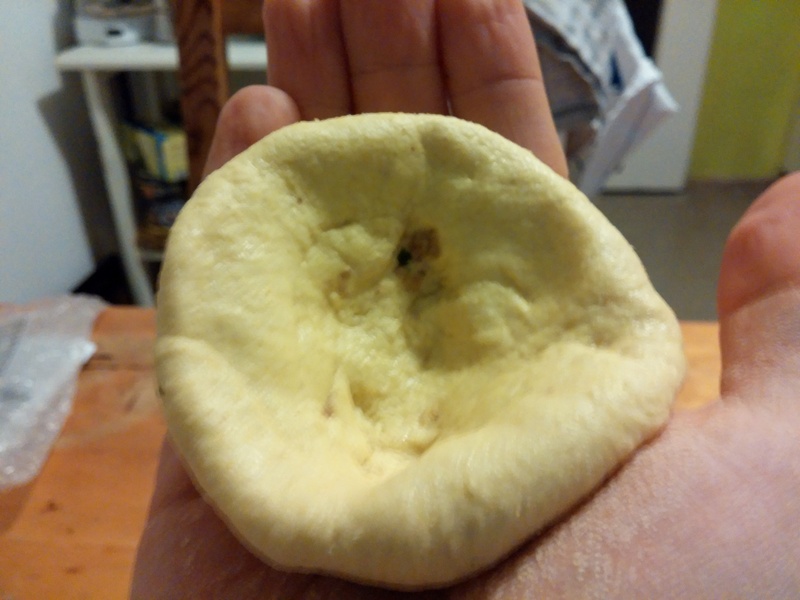 Then, fold the edges of the dough over, close tight and roll, to make a perfect circle. Then, the prepared circles should be drowned in a tasty yet simple soup: Grated tomatoes, lemon juice, sugar, salt. The soup should be rather thin, since the semolina will make it thicker later. Add some vegetables: the traditional ones are okras and pumpkin, or beet roots. The Kurds in North-Iraq cook the Kubas in a turmeric soup with chickpeas, mangold and zucchinis. Also tasty, but I can’t resist the classic version. 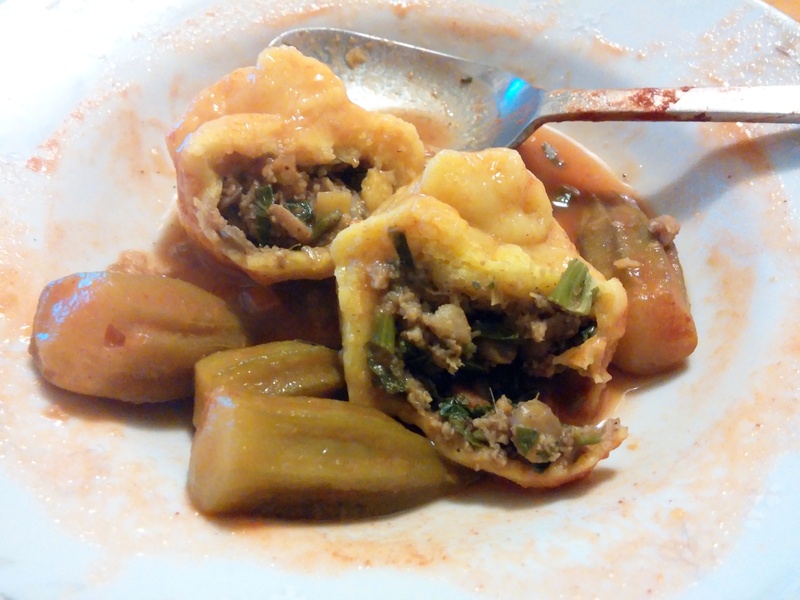 Posted in Main Courses, SubstitutesTagged Dumplings, Kuba, Okra, Soup, Vegan Iraqi food, במיה, קובה טבעוניתBookmark the permalink.